If Charles Krauthammer's description is accurate, then Bush's much vilified position was extremely important, on its own merits and for its future implications. I don't know enough about the subject to say if Krauthammer's depiction is accepted by everyone, but the relative silence the breakthrough has been greeted with may be an indication it is. I venture to say that nothing has happened to you in your whole life that had such importance for you as the attempts at marriage have had for me. By this I do not mean that you have not experienced anything in itself as important; on the contrary, your life was much richer and more care-laden and more concentrated than mine, but for that very reason nothing of this sort has happened to you. It is as if one person had to climb five low steps and another person only one step, but one that is, at least for him, as high as all the other five put together; the first person will not only manage the five, but hundreds and thousands more as well, he will have led a great and very strenuous life, but none of the steps he has climbed will have been of such importance to him as for the second person that one, firstly high step, that step which it is impossible for him to climb even by exerting all his strength, that step which he cannot get up on and which he naturally cannot get past either. Still later, I did see it again differently and realized why it was possible for you to think that in this respect too I was malevolently betraying you. You really had brought some traces of Judaism with you from the ghetto-like village community; it was not much and it dwindled a little more in the city and during your military service; but still, the impressions and memories of your youth did just about suffice for some sort of Jewish life, especially since you did not need much help of that kind, but came of robust stock and could personally scarcely be shaken by religious scruples unless they were strongly mixed with social scruples. Basically the faith that ruled your life consisted in your believing in the unconditional rightness of the opinions of a certain class of Jewish society, and hence actually, since these opinions were part and parcel of your own nature, in believing in yourself. Even in this there was still Judaism enough, but it was too little to be handed on to the child; it all dribbled away while you were passing it on. In part, it was youthful memories that could not be passed on to others; in part, it was your dreaded personality. It was also impossible to make a child, overacutely observant from sheer nervousness, understand that the few flimsy gestures you performed in the name of Judaism, and with an indifference in keeping with their flimsiness, could have any higher meaning. For you they had meaning as little souvenirs of earlier times, and that was why you wanted to pass them on to me, but since they no longer had any intrinsic value even for you could do this only through persuasion or threat; on the one hand, this could not be successful, and on the other, it had to make you very angry with me on account of my apparent obstinacy, since you did not recognize the weakness of your position in this. And yet: for all the failures described in the letter, one needs to keep in mind that it's Franz Kafka we're talking about, one of the most important writers of the 20th century, and in his own way, an important Jewish figure, too. Why not Talk about Annapolis? Some of you may have been disappointed that I didn't talk all week about Annapolis. Well, here's a comment about methodology. This blog deals, of course, with politics, as one of it's main themes. However, I don't see my task as merely repeating what others are saying. The world's media was chock-full of punditry about the Annapolis meeting all week long; I didn't see much that I had to add, especially as I honestly don't know what there is to say. When I do, I will. A while ago I reminisced about Sadat's visit to Israel, 30 years ago. I can't do the same on the 60th anniversary of the UN's decision of November 29th 1947 to partition Mandatory Palestine between Jews and Palestinians. However, Amos Oz can, and does very well, in his magnificent book A Tale of Love and Darkness. If you haven't read it yet, do. And if this means choosing between reading blogs and reading his book, read the book. (That, by the way, is a general statement. There are many books out there which are more important than blogs...). (For our German readers, it's Eine Geschichte von Liebe und Finsternis). Not clear what this is a picture of, is it? A multi-lane road, some nondescript buildings, and a thingy in the middle of the picture. Now, if I knew better how to operate Blogger's software, I'd tell the rest of the story in one post, but since I don't, it'll have to come in installments. Such is life. So. We've crossed the street and approached the thingy. Still not much clearer what it might be, huh? Though there is a vague resemblance to that super cannon the Iraqis tried to construct back in the 1980s - remember that one? But I digress. Is this any help? It looks like a rather banal though unusually white bridge over a road. Hint: the thingy is just outside the frame of this picture, to the left. And also, you might want to note that the bridge is supported, between the lanes, by some scaffolding. So It's a bridge that's under constructions, perhaps. Which might explain why it's so white and clean: it's new. Here's the picture that should explain all.... But it doesn't, does it. Ah, well. 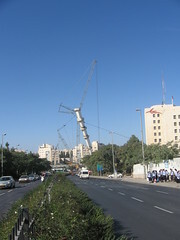 Santiago Calatrava has been commissioned to build a bridge in Jerusalem. 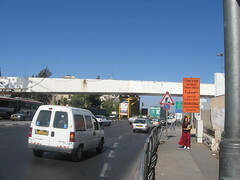 Admittedly, there are no rivers in Jerusalem over which to build a bridge, so the bridge will carry the new municipal train over the road into town at the entrance to Jerusalem. The idea is that the Thingy will grow to twice it's present height, and then steel cords will be hung from it, and the bridge will hang on them. 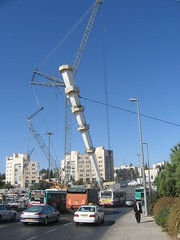 If Jerusalem didn't already have far more than its share of unique world-class tourist attractions, this will be another one. Unconvinced? Don't understand what I'm talking about? Well, you'll just have to keep visiting this blog to see the next installments, as the thingy rises higher and eventually becomes a bridge. 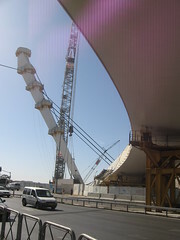 And when your grandchildren someday assume that the Calatrava bridge in Jerusalem was always there, you can send them to the (by then defunct) Lozowick Ruminations site, to see pictures of the bridge during its construction. This picture was taken from underneath the bridge, looking up. Siegmen's article is here, and my comments on it are here. Are Peace Negotiations Similar to Buying a House? Prof. Moshe Sharon compares negotiating styles of Arabs vs. Israelis (and not only them). In a nutshell: Arabs are better at it. Some of what he writes is pretty basic stuff, and can be summarized along the lines of "The negotiating side that can get up from the table and walk away will win". And also, don't show your cards. And don't give anything away, and if you have to part with something, make sure that the other guy parts with something more important. This is what they teach in freshman courses in law school and business school, isn't it? And if it isn't, what do they teach? And yet, it's not so simple, I fear. For many of us, the negotiation to purchase a home will be the biggest haggle we ever participate in - and there, it's us against the other side. There is no public opinion, no ideology, and, one might add, no danger of getting killed if you're wrong. Negotiations with an enemy over terms of peace do have all those complications, and then some. My point is that there may be an inherent, structural problem with peace negotiations, in that at the very least the democratic side has to carry out its discussions publicly before its leaders can reach agreements, and in the meantime, the other side has been watching. Thus, if Olmert can negotiate away Israeli control over Jerusalem or not, is not a secret he can hold close to his chest where Abbas can't see it and can only guess. Likewise, the possibility that Abbas might relinquish the Palestinian demand for a Right of Return is not an ace to be put on the table at the final, dramatic moment, if his public will get rid of him (perhaps literally) should he try to do so. Over the coming months, expect to be inundated with lies, spins, trial balloons, misinformation, accurate insider information, propaganda, pure nonsense, malicious nonsense, foolishness, silliness, and all the other tools with which the negotiators will try to craft negotiations in an environment where there are no real secrets, and the leaders cannot make decisions on their own. Yesterday he put up a short post about how Bush's Middle East Unravels Further (to be fair: this on the day representatives from all over the Arab world convene at Annapolis, an event somehow connected with Bush). He writes: The Palestinian Authority is divided and is a mess, with the elected government having been overthrown by a US-backed coup. Does Hamas Believe what it Says? We all see the world through a prism of our experience, our values, our context, and so on. The point is to try to balance this inevitable conditioning with intellectual integrity - both to be honest about what forms our position, and willing to change if the facts force us too. Not everyone can do this. Quite some years ago I wrote an MA thesis about a group of mid-echelon SS officers in Berlin whose job it was to persecute Jews. I must have read a few thousand pages of their documents, but my conditioning was heavily influenced by the faddish interpretations of the time, and I explained that what I had learned was that they must not have liked Jews, those SS officers, but the persecution was mostly the result of peer pressure, situational pressure as cogs in a totalitarian bureaucracy, the winds of war, and so on. Once I had finished, I went on to write a doctoral thesis about a similar group, more widely cast over most of Europe. For the PhD I must have read tens of thousands of pages of their documents, as well as a significantly larger amount of literature. In the doctoral thesis I proved that my MA thesis had been all wrong. It turned out, for example, that the bureaucrats had been committed antisemites years before they began persecuting the Jews, and that this was an important reason for their becoming SS officers in the first place. During the 1940s, they contributed significantly and very proudly to the evolution of the murder policy because they were convinced that it was the correct thing to do. So when this afternoon I read that the leaders of Hamas in Gaza are announcing that the Annapolis summit is essentially part of a conspiracy against the Palestinians, because it won't fulfil the elementary Palestinian needs, I think I know what they mean: That the elementary Palestinian needs are to have no Israel controlling any part of their definition of Palestine. And that's what they really think. Not as a reaction to Israeli settlements, or roadblocks, or Colonialism, or what have you. Not everyone agrees with me - perhaps because the facts don't support my understanding, they'd tell you. Or, perhaps because their understanding of the world doesn't include the concept of anyone really and truly thinking the way the Hamas fellows talk, hence it must be that they talk but don't meant what they say. Who could I possible be referring too? Well, here's Henry Siegman of the New York Review of Books back in April 2006; and here he is now, quite unfazed by anything that has happened in the world since last year. If I find the time tommorrow, I may decide to systematically take apart his recent contribution. Update: Here's my take on him. Labels: Antisemitism, Mideast General, Peace Negotiations, Rational Discourse? A copy of the annual report of the Radcliffe Institute for Advanced Study recently found it's way to my desk. (The ways of the world are mysterious, aren't they?). For those of you who've never been to Boston, Radcliffe used to be the women's part of Harvard; since 1999 it is a semi-autonomous part of Harvard dedicated to advanced studies. All in all, an important place as such places go. And the annual report is an important document, because it's used for fundraising and such. Chrome pages, lots of color, lots of grand words. Some of the research described sounded pretty impressive to me: "Tissue engineering to reverse the damage of heart disease", for example, or the "biocomplexity of infectious diseases such as cholera". Sounds like some people are hard at work making the human condition more bearable. Some projects, however, left me slightly uneasy. There was a group of historians who spent a year together with the purpose of exploring "the promise and perils of biography as a mode for understanding the past". I'm an historian, and can see why biography could or could not be useful: If done well, it is; if not, then not. One guest lecturer "made the case for a major shift in international resource allocation toward spending on development, education and health care. 29,000 children die daily from preventable causes; how many jumbo jets would terrorists have to crash in a day to kill that many people?" At the annual gender conference, subjects such as history, politics and ecology were explored through the prism of food. At one event, a group "attempted to use insights from Native [American] history to reconceptualize the existing framework for approaching history". If there were seminars on, say, the French Revolution, or the Greek and Roman classics, or theology, or Shakespeare, I missed the mention of them. In the meantime, you might want to visit Michael Totten's website. Michael is currently reporting from Fallujah, but on his way there he read us sections of Staff Sergeant David Bellavia, House to House, about the fighting in Fallujah a couple of years ago. Michael is a centrist, and voted Democratic last year. Still, if you can find any overlap between the things he's thinking about, and the things the folks at Radcliffe are thinking about, feel free to tell me what it is. Mishna: A man dies, leaving a widow, debtors, and inheritors, and also property. Rabbi Tarfon says: The weakest takes precedence. Rabbi Akiva says: Mercy doesn't supersede law. (Ketubot 84a, my translation). Admittedly, the Gemarah then complicates the crystal clarity of these two statements by adding layers of ifs, buts, and whens. So what is my take on the Annapolis Summit? I'm posting this for future reference, since making predictions is so tough, especially about the future (and thanx, Allan, for pointing out it was Yogi Berra who crafted that great sentence). I'd love for the negotiations to succeed. Like everyone else, I fully realize this will necessitate dismantling most of the settlements and some sort of land swaps for the rest. Much as I think it will be a bad idea, I know that reaching a deal will include changing the status of Jerusalem. Most Israelis knew this before the previous round, in 2000, but I think more accept it now than then, as indicated by the results of the previous elections. So does that mean peace is in the offings? Of course not. Because there are absolutely no indications that I've seen or heard of that the Palestinians have changed since 2000, unless perhaps for the worse - as indicated by the results of their previous elections. The only potentially significant change on the Arab side since 2000 is that this time much of the Arab world, lead by the Suadis, seems willing to back the Palestinians should they decide to make peace with Israel. Nice, that, but not enough if the Palestinians themselves aren't changing. If I'm proved wrong, feel free to link to this post as much as you wan't to rub my face in it. It will be a pleasure. 30 years ago I was an instructor at the Armour Academy when Sadat came for his historic visit (as I reminisced here). During the visit the staff did everything possible to spend as much time possible watching the visit on TV; our trainees mostly continued training as usual. Achikam is now at exactly the same stage of training that my soldiers were at then. Without wishing to divulge any military secrets here I can say that his unit has interrupted their training, and has joined the effort of ensuring there are no terror attacks during the week of the summit. I guess someone is less optimistic now than then. Haaretz is Israel's most important high-brow paper, which doesn't mean it necessarily gets things right, but it's an important publication. Inevitably, it's also mostly left-leaning, though not in an atavistic, thoughtless way, like The Guardian. For weeks I've been watching with interest as the paper struggles to align its political line with its reading of reality regarding the negotiations with the Palestinians in general, and the upcoming Annapolis event in particular. It has been an uphill job, resulting in what seems to me a bit of farce this weekend, the last before the event itself. Aluf Benn looks at Olmert and decides he's serious about the process, but past experience tells that every one of his predecessors who similarly changed their positions came to grief. Veteran pundit Yoel Marcus reminisces about Begin and Sadat, see no resemblances to Olmert and Abas, and sums it it thus: If peace comes out of Annapolis, I'll eat my hat. Professor Emmanuel Sivan, one of the most important scholars on the Arab world anywhere, frames the whole event in terms of Condoleezza Rice's mediocrity (he apparently has been observing her for decades), and concludes with the prediction that all we're about to see is "a parody of Camp David 2000" (which in my opinion was something of a parody itself, but that's just me). Nathan Sharansky, a foe of Soviet tyranny of the stature of Vaclav Havel if not greater, says that Annapolis will inevitably fail because its assumptions are all wrong, and we're dealing with the wrong Palestinians. Most telling of all, Avi Issacharoff tells that on the Palestinian side, nothing has changed since the fiascoes of 2000-2001; the Palestinians have learned nothing, and moderated none of their positions. His report seems not to have been translated into English, and I wasn't able to find even the Hebrew original on Haaretz' website. There is also an amusing caricature. The words in Barak's balloon are something like "Gosh, I really hope it succeeds". Finally, as a last stab at being optimistic, Akiva Eldar tells of a working group of Israelis and Palestinians who think the issue of refugees (or, I might note: the descendants of the refugees) can be resolved with 85 billion $, no more. Yet even here, the English version of the website does not offer the post-script of the article, which talked about Jerusalem, and, though I read it three times, I managed to find nothing in it to reassure me. The working group suggests, for example, that Jewish neighborhoods in Jerusalem , with hundreds of thousands of Jews, be dismantled, while the expectation is that Israel will continue footing the bill for social security and health insurance for the soon-to-live-in-Palestinian-Jerusalem Arabs. All this, I remind you, in a Lefty-newspaper. I'd like to wish a Happy Thanksgiving to readers of the American persuasion, and also to wish them much patience on their travels. I have it from a reliable source that the first pilgrims to celebrate Thanksgiving, way back in the early 17th century, partook not only of Turkey and cornbread but also of potato kugel. So for the veggies among you, take heart! Timoty Garton Ash wonders what to call those who would murder us. Ash is a thoughtful scholar who often has interesting things to say, and I've linked to him in the past. In the last 50 years the label "fascism" and "fascists" has been profligately over-used and hollowed-out to mean little more than "something the left hates at the moment". If it's bad, and you're on the left, you call it "fascist"; if it's fascist, it feels good to be against it. The list of things described by people on the left as "fascist" over the last half-century would fill several pages, and certainly include Margaret Thatcher, the United States, the Federal Republic of Germany, capitalism, men (aka male chauvinists) and the Daily Mail. There is a delightful irony here, that Ash doesn't notice, in that it isn't the Left that's using the epithet "Islamofascists", it's the Right. This is because much of the Left (tho not people of Ash's stature or intellectual integrity) is too busy pretending there isn't really a problem of much magnitude, while Rightists who do use the term are also, as a side benefit, trying to re-claim the term in its 1930 meaning, before the Left did with it what Ash says they did. So why not use "Islamist"? Most Islamic terrorists are, in some sense, Islamists, but most Islamists are not terrorists. They are reactionaries. They propose a profoundly conservative religious vision of society which, in its attitudes to free speech, apostasy, homosexuality and women, is generally anathema to secular liberal convictions (including, emphatically, my own). But for the most part they do so through peaceful political means, not through violence. At the most moderate end of the broad spectrum of political Islamism, as represented by Prime Minister Recep Tayyip Erdogan's Justice and Development party in the secular state of Turkey, they are closer to the Christian religious right in the US (for many of whom homosexuality is a sin and abortion is murder) than they are to al-Qaida. For us secular liberals, this religious reaction is also a very bad thing, to be combated with all the peaceful means at our disposal, but it is a different thing - and we make a mistake if we blur the distinction. Well, no, not really. He's right, of course, that most Islamists in the broader meaning are not violent, but then, many supporters of fascism didn't personally intend violence, either. There's a continuum here, and it seems to me he's too sanguine. What's true about Erdoagan's Islamist party in Turkey (and, you might add, the Islamist party in Israel) may well not be true elsewhere; I'd say that once you've distinguished between Islamist parties in democracies (Turkey, Israel, and no-where else) and Islamists everywhere else, his reasoning seems less convincing. Eventually he suggests using the term Jihadists. In spite of the reservations I've just mentioned, I tend to agree with him. PS. If after reading the article you then spend a couple minutes reading the comments, you'll get a fine sense of what some of the readership of the Guardian thinks about all this. Enjoy. Does anyone know if and how to use Google Earth as a blogging tool? Because if I knew how, it would be possible - within G-E's limitations - to show lots of places and areas that get talked about all the time by people who really don't know what they're talking about. So if you can help, either tell us all in Comments, or send me a mail. The front page of Haaretz this morning carried these two stories: In France, Israel is becoming trendy, especially Israeli literature and arts, but this is happening in a generally positive light. Meanwhile, at the other end of the Chunnel, in London Israel is regarded more and more as the most evil country on earth, and it has become bon-ton to talk about dismantling it and replacing it with something else. The French turnabout is surprising and needs to be explained. The British story is what you'd expect of a country where respectable newspapers consistently lie (see previous post). Then again, to be fair, it's worth pointing out that many of the instigators of the anti-Israeli actions in the UK are... Israelis. They belong to the farthest fringe of Israeli loonies, but in London they're popular and eagerly sought guests. Most conspicuous of all are the settlements. Miliband was driven from Jerusalem to Jericho past mammoth new housing developments, stretching deep into the West Bank. To serve them, a myriad of new roads was being scored into the earth: smooth and black and closed to Palestinians, whose olive groves were left as rows of black stumps. Now it just so happens that I took that same road, yesterday, twice. Once down towards Jericho, once back up to Jerusalem. It's one road, not "myriad". So far as I could see, it isn't closed to Palestinians, otherwise how to explain the fact that at the (few) checkpoints, Palestinian cars are checked? I mean, if they're not there? Most significantly, however, in both directions I looked at the two only fields that could possibly fit Borger's description of blackened olive trees. I stared at them, because they are indeed rather puzzling. Back in the 1970s, so far as I can remember, they weren't there at all: merely a parched and dusty hillside. Then in the 80s, as Jewish settlements were built nearby, someone planted them with some kind of desert crop - acacia, perhaps? I sort of thought it must have been the initiative of the new settlers, but maybe I was wrong. I didn't give it much thought - two fields out in the desert, nothing all that noteworthy. And then yesterday, I was struck by the fact that all the stumps look dead. There was never an olive tree there, the stumps aren't blackened stumps of them, and anyway, what's the connection between Maaleh Adumim, some miles up the road, and those two fields? Maybe the acacia's all died of something? Maybe the owner, whoever he or she might be, stopped watering them and they died? Indeed, I don't know - but I do know that Borger's version is hogwash. I spent the day out in the desert, far from the Internet, newspapers, political matters et.al. S0 no talk about any of that today. At the end of the day I came across William Saletan's attempt to deal with growing evidence that there probably is some sort of connection between race and IQ results. I liked his article (actually, a mini series of three) for his starting point: if there are uncomfortable facts out there, they remain facts even if they're uncomfortable. And now, let's try to understand the issue. Wouldn't it be nice if most people used this method most of the time? Or even, twice a week? Once a month, but predictably and consistently? Bisecting the West Bank. Or Not. Yesterday I linked to an article in the Guardian about the evil Israelis. One of the standard things about such articles is the lack of facts, and their substitution by statements that sound factual and convincing but are actually pure propaganda. In this case, the statement that Israeli construction in E1, east of Jerusalem, will for ever prevent a viable Palestinian state. Which of course is nonsense. On various levels. To take just one: say there's a Palestinian state to the north of Jerusalem, and it's southern half is south of Jerusalem, and to the east there's a band of connecting territory that's a mere 10-15 miles wide, why is that different from the mirror situation along the coast, where Israeli territory is only some 12 miles deep? Well, actually, there is a topographic difference, in that the coastal area is flat, while to the east of Jerusalem the land falls steeply to the east, and a Palestinian road from north to south would have to go down and up again. Or, perhaps, it could hug Jerusalem on its Eastern perimeter, without climbing up or down? Sort of like a bridge from, say, Washington DC to Alexandria, VA, where the Pentagon and Reagan National Airport reside? Does that bridge make Washington non-viable? And does the need for tunnels and bridges between Manhattan and everywhere else make Manhattan non-viable? The reason I ask is that Haaretz today tells that precisely such a road is being built. Haaretz doesn't like it, naturally, and says that it looks like Apartheid, but to my jaundiced eye it looks more like a border between two nations who can't live together and wish to divide their land between us and separate from one another. Reality can be so complicated, can't it? The New Republic is currently carrying an article which starts from the preposition that Democrats and Republicans alike have no intention of funding health treatment of illegal immigrants in the US: they don't pay taxes, and they're illegally in the country, so the US owes them nothing. I have no position in this debate. In Israel there has been a discussion recently of the problems our security forces sometimes make for ailing Palestinians who wish to be treated in Israeli hospitals (would you want to be treated in a Palestinian hospital if there was any alternative?). In a rather unusual but extreme case, a number of Gazans were refused entry into Israel last week, and now one of them has died of the cancer he hoped to be treated for. Kind of hard to see what sort of security threat he could have posed. Here's something I wrote about this subject and others, about three and a half years ago; a version of it then appeared in the Jerusalem Post. The situation was complicated then, and is no less so now. Anwar Sadat's truly historic visit to Israel began thirty years ago today. For all of us old enough to remember it, it was a truly awesome event, unforgettable down to small details. Context: by 1977 Israel had fought four full wars with Egypt. In 1948 Egyptian forces whose mission was to destroy Israel were stopped some 30 miles south of Tev Aviv, while others reached as far north as the southern suburbs of Jerusalem. The explicit goal of eradicating Israel led to the next two wars, in 1956 and 1967. After the resounding Israeli victory in the Six Day War in 1967, the Egyptians couldn't credibly plan to destroy Israel, but the war they launched in October 1973 was more devastating for Israel, in many ways, than any of the previous ones. It was launched by Anwar Sadat - the same man. Some 2,500 Israelis died in that war - more than in any other campaign between 1949 and today. In 1977 I was an instructor in the Armour Academy; previously, I had served in an armoured brigade in Sinai, facing the Egyptians. Our training was all geared against the Egyptian enemy; anyone more than two years older than us, meaning all our officers when I was in training, had fought against them. November 19th 1977, if I remember correctly, was a Saturday. On the previous Wednesday, when I announced to the soldiers we were training, who had no access to the media, that by the end of the week the Egyptian president would be in Israel, they gave an incredulous shout of astonishment. That Saturday evening we suspended whatever had been planned and crowded around (black and white) TV sets. What followed were two days of unbelievable events: An Egyptian airliner on the tarmac; the Egyptian President appearing in the opening, then descending the steps, then shaking hands with our entire leadership; the next day, the President of Egypt standing in the Knesset, talking, in Arabic, about peace, and his immortal sentence in English, which I can still recite today with his accent and inflections: "No more war. No more bloodshed". Gideon Levy, with whom I rarely agree, writes about the same events here, in similar terms. It's a fine description, until near the end he implies that the wars were the result of brainwashing. This is a fallacy easy to fall into: that once warring sides have made peace, they gain a new perspective on their wars, which seem foolish and unnecessary. I have no doubt that this can happen, but it doesn't have to. Sometimes, no matter how much perspective one gains, and even with all the possible hindsight, past wars steadfastly remain justified. Present and future ones too, potentially. Seth Freidman, writing in The Guardian, offers the usual fare: Both Palestinians and Israelis will have to make compromises, but since Israel is the stronger side, she must do more, and first, and responsibility for no peace is Israel's. And of course the settlements are the source of all evil. If I were in London, and was paying for a dead-tree version of a newspaper, I probably wouldn't choose the Guardian if only because of the sheer predictability and boredom factor. All the while, the situation in Gaza is a daily demonstration of the foolishness of the Guardian thesis: Israel took the initiative, dismantled the settlements, pulled out her forces, and at the time - late summer 2005 - handed over control of Gaza's border with Egypt to the Egyptians and teams of inspector from the EU. And lo and behold: No peace! Nor even anything remotely resembling peace. And yet... The situation in Gaza really is awful. Steven Erlanger of the New York Times has just filed a report from there (and note the recorded parts that can be listened to only on the web-site version of the NYT). In spite of what the Guardianistas and their ilk like to say, Israel is fundamentally not responsible for the misery in Gaza. But no decent person can observe the misery and remain unmoved. It truly is awful, and apparently not getting any better; the prospects are mostly that it will get worse. And Israel is part of the story - past, present, and future. I don't know what we might do that would make things better, but simple human compassion for people in dire straights is still called for. I wish the Gazans had a better life, and a rosier future. I really do. Israel is the country that broke the Nuclear Non-proliferation Treaty in the Middle East and introduced nuclear weapons into the region, kicking off an arms race with Iraq that in many ways led to the Iraq War. US and American complaints about Iran's civilian energy research program never acknowledge Israel's own outlaw status with regard to nonproliferation. Well, no. Israel didn't break the NPT, because along with India and Pakistan, Israel never signed it (North Korea signed, violated, and withdrew). Iraq violated the NPT, tho may have desisted after Israel destroyed its Tammuz reactor in 1981. Iran is probably violating the NPT. Actually, since the NPT was open to be signed in July 1968, Israel may already have had either nuclear weapons or at least a nuclear program well before then, though I don't see how I (or Cole, or anyone else outside of a very small circle of relevant Israelis) can prove this. Having falsely identified Israel as an "outlaw", Cole then goes on to tell that this is cause for the present war in Iraq. If you want to follow that kind of path, however, why not go further? The Jewish insistence on preserving an identity and culture has created endless tension and even violence these past 3,000-some years, and the world might have been a much calmer place without the Jews. Here's a long article abut a new Israeli documentary film, "lir'ot im ani mechayechet" (To See if I'm Smiling"), about women soldiers in the IDF who served during the first and second Intifadas. It's not pleasant reading, but it's necessary. At the moment, I'm simply posting, not commenting and certainly not arguing - especially as the stories are themselves mostly complex, and morally complicated, and the moral reality portrayed in them is not easy to unravel. I will however note that Meir, my older son, served for a while in Hebron not long after one of the periods described in the article, and came back with stories that were no less compelling but quite different. So sometime soon I'll come back to this post. Last week I linked to a review of Sages, an interesting book published recently by the Rav Benni Lau, who officiates as the Rabbi of our congregation. At the risk of appearing to be a groupie, which I'm not, here's a link to an article published yesterday about Lau's understanding of what the Rabbinate should be doing and what it's not; I mostly subscribe to his positions. Judith Apter Klinghofer looks at Israel's economy, and also at the Palestinian one, and decides it's the Palestinians who need peace more than the Israelis (which isn't so surprising); foreign aid is bad for the Palestinians; and living in a state of war doesn't particularly damage the Israeli economy. Not so much counter-intuitive (which it actually isn't) as much as counter-everything-the-pundits-say-all-the-time. Jerusalem's open air market, Mahane Yehuda, is a colorful, fascinating, bustling, noisy, and mobbed place. This morning, as I passed through the southwestern security gate on Agripas street, I noticed an elderly beggar in a wheelchair, and a 30-something haredi man squating in front of him. Both had open books in their laps, and they were poring over them, deep in discussion. From the briefest of glances that I managed to sneak I'd say they were studying Torah, perhaps the weekly portion; the page seemed not to have the format of a Gemarah page. They were quite oblivious of the rest of us. Someone put up posters on billboards in Jerusalem (perhaps also elsewhere?) featuring a glum-looking Olmert with bars superimposed in front of him, and the caption (in English, for some reason): Annapolis WON'T Save You! This would be referring to the theory that Sharon invented the disengagement from Gaza to escape criminal investigations into an assortment of alleged scams. Olmert's collection of piling up allegations is, if anything, larger than Sharon's. What is the furthest point in the world from the Middle East? Offhand, I'd look for it in New Zealand, but Jade Mountain, in St. Lucia, should definitely be a candidate. Here's the first in what will probably be a series of reflections as we approach the Arab-Israeli-American event at Annapolis, later this month. About a week ago Haaretz had a rather startling article by Danny Rubinstein about the Palestinian national movement. Unfortunately, so far as I can determine, no English version was ever posted at their website. (Here's the Hebrew original). Rubinstein is one of those knowledgeable, Arabic-speaking, left-wingish Israeli journalists that Haaretz likes to employ, and I like to read because they're informative, tell us things we otherwise probably wouldn't have known, and generally speaking don't allow their politics to blind them to the reality they're reporting on. Rubinstein once wrote a biography of Arafat, and if memory serves, he didn't pretend to have understood what the man was about. The thesis of the article cited here was that the Palestinian national movement is, if not dead, then dying. Part of this is the disappearance of the nationalists, who have either died, or given up and left, going back to more comfortable lodgings in Jordan, Egypt, or the West. Abu Mazen, one of the remaining figures, is a powerless figure of popular derision, says Rubinstein. The Jordanians are retaking institutional positions in the West Bank they had abandoned in the 1980s and 1990s. Hamas, anyone? None of this is to say that the Palestinian issue is disappearing, only that the possibility of the Palestinians getting their act together as a national entity (=state) is diminishing. One reason Rubinstein's piece resonated with me was that I'd already heard it. I recently read Hillel Cohen's "The Rise and Fall of Arab Jerusalem 1967-2007", (Hebrew), The Jerusalem Institute for Israel Studies, 2007. (Yes, Cohen is another one of that same group, tho he doesn't generally write for Haaretz). The book goes into lots of (interesting) detail about things happening in the Arab sections of Jerusalem, but the outline is the same: In the 1980s it really looked like East Jerusalem was the de-facto capitol of an inevitable Palestinian state, but this has changed completely since the collapse of the Oslo process. On the one hand, Israel's power has proven greater than that of the Palestinian institutions, many of which are no longer in town because they were forced out, or because the Israeli security measures and above all the barrier, cut Arab Jerusalem off from the West Bank. On the other hand, the Arabs of East Jerusalem themselves are making choices of their own: most of them did not join the 2nd Intifada in any meaningful way (tho Cohen details the actions of some murderous cells that did), and as the gap in levels of income between East Jerusalem and West Bank grow, there is ever less enthusiasm for being part of the West Bank. It isn't even solely a matter of economics: the chaos in the West Bank these days may be a far cry from that in Gaza, but seen from East Jerusalem life in the PA doesn't look so good. Cohen also warns that none of this means the Arabs of East Jerusalem have embraced Zionism or wish to be Israeli patriots. But they're waiting, and in the meantime, they're drifting away from the West Bank, and their aspirations for the future are apparently ever less clear. Remind me some day to propound my ironic theory whereby the further Palestinians are from Israeli rule, the worse off they are. Ovadia Hamama recently put out a very interesting record, which sold very well since one of the songs, a novel rendering of a Cabalistic verse many people had never heard of, became a major hit (Ana beKoach). Well, no-one had heard of Ovadia before, either, since he seems to be all sorts of things but not a recognized singer. The seventh song on the record has an elderly man with an Iraqi accent reading a letter which was obviously written around 1949, when he was a newly arrived immigrant dumped on a kibbutz far from his family. This is the stuff of much academic research since the 1980s: how the hegemonic ashkenazi establishment forced the poor and bewildered masses of traditional Jews from the Arab countries to come to Israel to serve as the underclass, their identity was torn from them, the hegemonic narrative was force-fed to them. Proof of all this? Well, take this letter, for example: the poor dupe tells how life at the kibbutz is good; he has volunteered to work in construction; young men are allowed to walk on the beach with young women; last week they were all bussed into Tel Aviv where they heard speeches, including one by Ben Gurion himself, and then they danced in the street until dawn, and isn't this a fabulous country?! But then you read the small print in the enclosed booklet. The letter was written by Ovadia's father, in 1949, to his brother who was still in Iraq, and has remained as a prized possession in the family ever since; the father himself is reading it in the recording, accompanied by his grandchildren; and the whole thing is obviously a source of pride and lore. An email reached me yesterday at my Yad Vashem address from a woman in her 70s, a Holocaust survivor. "I have achieved my revenge on the Nazis", she wrote, "I have raised children and grandchildren in our homeland". However, she continued, what she still hadn't achieved was closure; for that she hopes to find other people who shared her particular segment of fate, and might we be able to help her in finding them? This post will have no links, since it will poke grim fun at a person who means well, has done me no wrong, and my problem is with her ideas, not herself. Wandering around cyberspace today I came upon a psychologist offering advice on how parents should treat their two-year-olds who are testing their newly discovered power to be obnoxious (my formulation). 1. Meet her basic needs. She will certainly whine if you force her to endure one more errand when she’s hungry and tired. The problem with whining is that it becomes a habit. Why create a negative situation which she’ll then repeat? 2. Be pre-emptive. Make sure that your child gets enough of your positive attention, unprovoked. Pre-empt whining by giving attention BEFORE she gets demanding. Anyone who’s had to ask a romantic partner “Do you love me?” knows that attention given after you ask can never really fill the need. The secret is to take the initiative and give attention the child hasn’t asked for, often, so she feels your support and connection. And of course it’s particularly important to give attention when she shows the first sign of needing your emotional support, before that quick downhill slide. 3. Give her alternate tools by teaching her how to ask appropriately for something and negotiate with you. Since whining is a function of powerlessness, generally helping your child to feel that she can get what she wants through reasonable measures will carry over into the rest of her life. In other words, you don’t want her to learn that she gets her way in life by whining or tantrumming, but you do want her to learn that she can get what she wants through managing her emotions, seeing things from the other person’s point of view and setting up win/win situations. How? “Ok, you want to go to the playground, and I need to stop at the hardware store. Let’s do this: If you cooperate at the hardware store, we’ll have time to stop at the playground on the way home. And if you are really good about getting in and out of your carseat and not dawdling as we leave the house, we can stay at the playground for five extra minutes.” If she feels like she only gets the playground by whining, she’ll become an expert whiner. 4. Don’t reward whining. Don’t give in and buy the candy. Be nice about it, but explain that we don’t reward whining. Of course, be prepared for her to switch gears and ask nicely. Then you might have to reward that with extra time at the playground, even if you can’t agree to candy! 5. Support her in pulling herself together and talking normally. It’s fine to say “My ears don’t hear whining. Can you ask me in a regular voice?” but try to say it warmly and supportively. Reward all her efforts to express herself positively. Huh. Now why didn't I ever think of that? All those fear-casting facts I've encountered in life? They're all figments of a neural network that helped my ape-like ancestors to survive all those falling coconuts in their jungle. All you need is to think positively and encourage everyone warmly and supportively and the world will be perfect. You have to admit that most of the time, you don't. On the occasion of the 3rd anniversary of his death I did a bit of googling, and found remarkably few items mentioning him these past three years. Perhaps he wasn't as important at they told us most of his life. Here's an article from today telling about how the world has changed since his "mysterious death". To be honest, I find myself unconvinced. Sure, many of the props have been shuffled, but has anything fundamental changed? I expect to mull this over in the coming weeks, as we approach the Annapolis event. Out of the blue, for no particular reason, Michael Handelzaltz dedicates his weekly column to the story of the death of his grandmother in Warsaw in September 1939. The story was related by his grandfather, who saw himself as the survivor of a tragedy, and his woe echoed down to his grandson on three different paths, as told in the article. The real irony, of course, is that the grandfather didn't survive, he merely died later, and almost the only thing his grandson knows about him is how he mourned the death of his wife. This underlying theme of contemporary Jewish life, which will not disappear anytime soon, is an illustration of the depth of the Jewish trauma of our age. Our critics (including the home-grown ones) love to mock us for being so caught up in memories of the Shoah, but that which they mock is merely human nature. Perhaps because they aren't interested in human nature. Last week I linked to an optimistic article about Haredi women moving into the labor force, and I identified this as part of a tectonic change. Here's an article with statistics that demonstrate that there's still a very long way to go: 70% (!!!) of the Haredi man are unemployed, and 50% of the women. Rabbi Elisha ben Avuya, who became an apostate and was thereafter called Aher (Other) is one of the most fascinating of the Tanaim, the sages who created the Mishna. A new book (in Hebrew) takes a new look at him - or mostly, at how he was remembered by the Jews of the Galilee verses their cousins in Babylonia. I have always felt his story to be extraordinarily powerful and complex. Here's an interesting review of an interesting book by an interesting youngish scholar (as scholars go). The Rav Benni Lau is the rabbi of the congregation we are members of, and he has recently put out the second volume of his group biography of the Tanaim - the rabbis of the Mishnaic era, some 2,000 years ago, give or take a century or two. Since the book will probably not be available in English anytime soon, the review is second best and also the best you'll get. As the possibility of dividing Jerusalem looms, hundreds of Palestinian residents of East Jerusalem are applying for Israeli citizenship, in the hope that if the division happens they can stay in Israel. A group of law students, waiters, and a law professor who teaches his students how to engage in social issues has forced a chain of cafes to hand tips over to the waiters, rather than pocketing them and doling out only leftovers. You'd have thought this would be so obvious - elementary decency, even - that it would be a non-issue, but it seems you'd be wrong. I can't link to this because it's not in the papers. I learned it from a friend at one of our far-lefty human rights organizations, who has me on his mailing list for whatever reason. (So I can quote him approvingly in rare cases, I suppose). Anyway, the law professor is Itai Svirski of Tel Aviv University. Here's a story about a book that's so ancient it was smuggled out of Jerusalem when the Crusaders first arrived (1099), at which time it was already almost 200 years old. It survived intact until 60 years ago minus three weeks. Here's an interesting and optimistic piece about an American insurance company which is employing Haredi women as insurance evaluators. Since they work Israeli mornings, nighttime in the US, the company saves time; they are also working for salaries that are lower than anything comparable in the US. However, unlike many business that use English-speaking employees in India or the Philippines, these women are doing quite skilled work. I'm familiar with a number of such places, and their advantage over the Asian competition is in the skills of their staff: they don't even try to compete at the simple levels. The whole movement was given a tremendous boost a few years ago when then-Finance Minister Netanyahu slashed the subsides of large families (code: some orthodox, most Arabs, and essentially all Haredis). There was a cacophony of squawks and shrieks about his cruelty, but it seems he was right on all parameters - this being merely one of the longer-term results. And very long-term it may prove to be, if it helps in healing some of the severe distortions that have characterized the Haredi communities in Israel these past two generations or so. (Their New York cousins never had this particular set of problems, since no American government would ever have dreamed of subsidizing them off the labor market for generations). And note the final paragraph to see the full subversive power of this change. To round up this thread, here's a short article I wrote about Machsom Watch about three years ago. Since the fine folks at NGO Monitor recently thought I was against them, it's time to link to them in an approving way. A good place to look would be at their recent report on Machsom Watch - that group of Israeli women who purportedly watch the IDF roadblocks so as to ensure that the IDF troops treat the Palestinian civilians correctly. Actually, as NGO Monitor correctly notes, Machsom Watch has a much broader agenda, which includes "ending the Israeli occupation". I myself have had a number of interactions with them which indicate that this time, NGO Monitor is quite right in its criticism. A few years ago, for example, I participated in a series of op-eds in Haaretz about how bad Israel really is (predictably, I was claiming that it's not all that bad). Since I was out there in the public eye, I received various responses, one of them a thoughtful letter from one of the women of Machsom Watch. While her tone was civil and sincere, her thesis was that she has many Palestinian friends, and part of their common ground is their mutual agreement that the IDF is to blame for just about everything. What used to be called "a useful idiot" in a different historical context. Then perhaps two years ago Achikam and I participated together in a lecture series set up by a far-left organization that wished to educate the Israeli public about the evils of the security barrier aka Apartheid Wall. Most of our co-students were, how to say this, of mildly different political persuasions than the two of us. One memorable afternoon Achikam and I sat quietly in our chairs before the beginning of the lecture, and listened as two women from Machsom Watch told one another about the efforts they had recently gone to to somehow stage a photo of an Israeli soldier with his gun pointed at a Palestinian woman or child, and their frustration that - angles of photography notwithstanding - they somehow hadn't been able to create the incriminating photo. Achikam quoted that story often in the following weeks. Here's a picture such as you'll never see in the media. I cannot give it an exact date or place it accurately, but it's clearly a picture of an Israeli soldier (of the Nachal infantry regiment, by his beret), having a friendly interaction with a Palestinian child. I took it off an e-mail that was sent out from The Association for Prosperity and Security in the Middle East. A report in Y-net a while back (last July) identifies this association with the Israeli chapter of the Scientologists. To be honest, I'm not overly interested in the agenda of whoever is sending out such pictures; the pictures themselves interest me more. Might it be a falsification? Given that Hezbollah and other Lebanese have a track record of falsifying pictures depicting Israeli atrocities, you can't be certain this is authentic, save for one consideration, and that is that anyone who has ever watched IDF soldiers interacting with Palestinians knows from experience that such scenes happen - jut like the other kind, regrettably, also happen. I had a brief meeting early this morning in one of our top hotels. As soon as I got there it occurred to me that the American Secretary of State, Dr. Rice, must have arrived in town, because the place was literally swarming with security types. It's funny how those guys (and some gals, too) stick out like sore thumbs. A drunk blind man walking backwards in a dark alley would identify them from half a mile. It appears not all of my readership agrees with me that Israel was too careless with Lebanese lives in last year's war. Since I'm not coming to the discussion as a bleeding heart pacifist or some such, I can see the sense of their objections; however, precisely because my position is that the waging of war is NOT the worst thing that can happen, and Israel will unfortunately need to continue at war for quite some time, we need to adhere to the highest practicable standards. Last year, we didn't. Our standards were much higher than those of our enemies, of course, but that is very feeble praise. Martin Kettle at the Guardian finds himself participating in the English version of the same discussion. Many of his readers take him to task for daring to recognize that the subject is a thorny one, with no easy answers. I am aware that I haven't been telling much of interest about Achikam's experiences for a while. Actually, I hope very soon to pull together lot's of impressions he (and I) have been collecting, and to post an article about them. In your blog posting, you acknowledged NGO Monitor’s critique of Human Rights Watch and its head, Kenneth Roth, but then you noted that the information and analysis that we provided would not change your opinions. I admit that I cannot understand how, after seeing the specific examples of HRW’s unverifiable, and in many cases, clearly false claims, and its obsessive condemnations of Israeli responses to Hezbollah, you still believe" that it would have been better had the IDF tried to learn from [HRWws] report on the war in Lebanon last year” and that Roth is “unfortunately, right, and the IDF people are wrong." I wonder what evidence it would take to convince you that HRW, and Roth in particular, have a strong ideological agenda and that their research capabilities, particular when dealing with Israel, are practically non-existent? HRW’s condemnations against Israel are almost entirely based on reports of so-called “eyewitnesses” based in Southern Lebanon, and the latest report on last year’s Lebanon war regarding the number of civilian casualties in Lebanon is full of huge holes. Perhaps if you read some of NGO Monitor’s detailed analyses on HRW since 2001, you would recognize that HRW’s “halo effect” hides some nasty ideological agendas and biases. point. HRW published condemnations of Israel without any verifiable evidence. If NGOs were to use a reliable and consistent methodology, more governments, including the Government of Israel, would take them seriously. As it stands, it is the powerful NGOs that need to be examined. HRW’s annual budget is close to $50 million – money that could be much better spent. For example, as NGO Monitor has shown, for the past two years has spent only a small fraction of its resources on the abuses in Burma . This is an important issue, both for Israel and for the effort to restore the credibility and impact of universality of human rights norms, and to end the exploitation of the language to promote the ideological and personal agendas of NGO officials. But you see, I'm not really arguing with Steinberg, nor embracing Kenneth Roth. What my original statement was, and obstinately remains, is that since Israel was too careless with the lives of some Lebanese citizens in last summer's war, we need to be figuring out what we did wrong so as to learn from it for the next time (yes, there most assuredly will be a next time that Israel will be at war). I wish we weren't in such a situation, for all sorts of reasons, first and foremost because of the innocent lives lost, but we are. Israel wasn't trying to hit Lebanese civilians, as Hezbollah was aiming indiscriminately at Israeli civilians; I even have no reason to think that Israel was callously disregarding Lebanese citizens in its attempt to hit Hezbollah; but there can be no doubt that Israel was being less careful then necessary, and that as a result innocent Lebanese died. If Kenneth Roth - even he - has anything to tell about the events that we can learn from then we should be listening. Not because he's such a reliable witness. He probably isn't. But that's not the issue. For a fuller description of my take on Israel's 2nd Lebanon war, see Michael Totten's interview with me, here.